Photo by Lola Lariscy. Clint taught me to build the fire. It is whispered in the woods of the North, by the followers of the old gods and the new, that there is a liquid. The drops coat one’s tongue with the tastes of dark fruit and sweet caramel. A shock of spice kicks the mouth like Arya’s horse when startled by the Hound. Much like Tyrion, the booziness makes itself known (particularly at the finish), but doesn’t overstay its welcome. The complexion is darkened by malt, with a creamy, dense head. The carbonation isn’t abundant, and dissipates quickly, but in a beer this full, you want to get straight to the gold. The aroma is like the best cologne I wish my boyfriend would wear. It’s malty, spicy-pungent and strong enough to raise [SPOILER] from the dead. I bet this would go fabulously with non-pasteurized cheese. At 8% ABV, I should not drink this entire bottle tonight. However, the night is long, winter is here, and there be crazy snow zombies out there. That’s breaking news, folks. 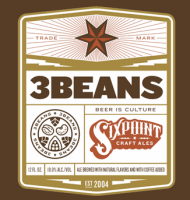 I had Sixpoint Brewery‘s 3Beans for the first time, and it was lovely. Thanks go to Justin for sending it to me. It’s a full-body, rich beer. It’s infused with the oak from the barrels it was aged in, giving it a woody, smoked flavor. There isn’t a micro meter of space wasted in this beer. Every bit of it has flavor: cocoa, coffee, malt and a little hint of spiciness—almost like chili peppers. That probably comes from the beans. The coloring is a medium brown. The head is creamy, smooth and khaki in color. I would drink this beer any day, and be happy for it. I hope this isn’t my last time drinking this beer! Seekabrew says that I should have full distribution here. I’ve only seen one Sixpoint beer here ever, and that was the one I had Thursday night. Let’s hope I see 3 Beans here in the future.